The shuttle bus back to Oaxaca was more or less the same nauseatingly twisty stretch of road we’d been on a few weeks prior. It was like a bad joke that was a little funny at first but then remained funny far too long to be comfortable about the truth of the situation. When the bus finally breached the green surface of the mountains and into the valleys at the foot of the Sierra Madres rain was ready to greet us as we sped through flatter terrain adorned with pueblo’s and grassy fields. The soil composition in this area is mostly clay and this short heavy rainstorm turned calles (streets) into rios (rivers). The muddy wake from our van was cresting over the curbs as we passed cars stuck on side streets and people drenched to the bone. Rain is relished in this area during the dry season so I’m sure it was a blessing and welcomed wholeheartedly. 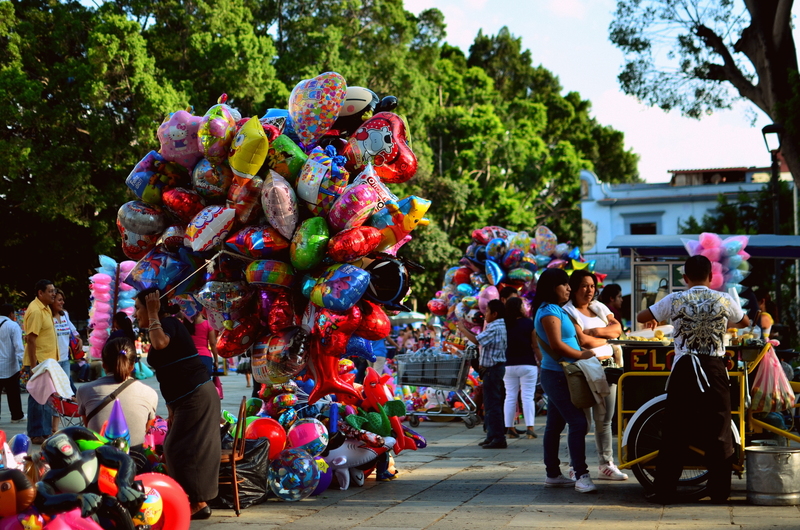 A healthy walk through Oaxaca from our bus shuttle depot brought us through numerous streets filled with puestas breaking down their mobile stores and packing away their goods for the night. 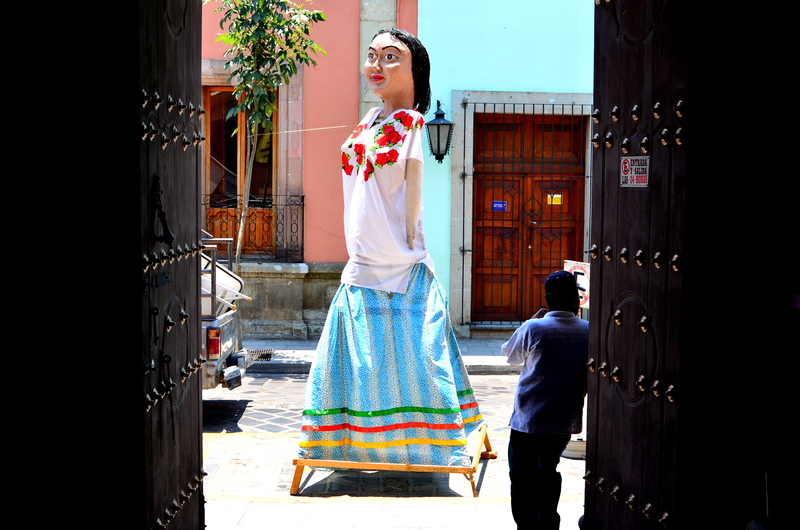 We found a decent hostel and strolled around for some of the classic Oaxacan food we’d been dreaming about. 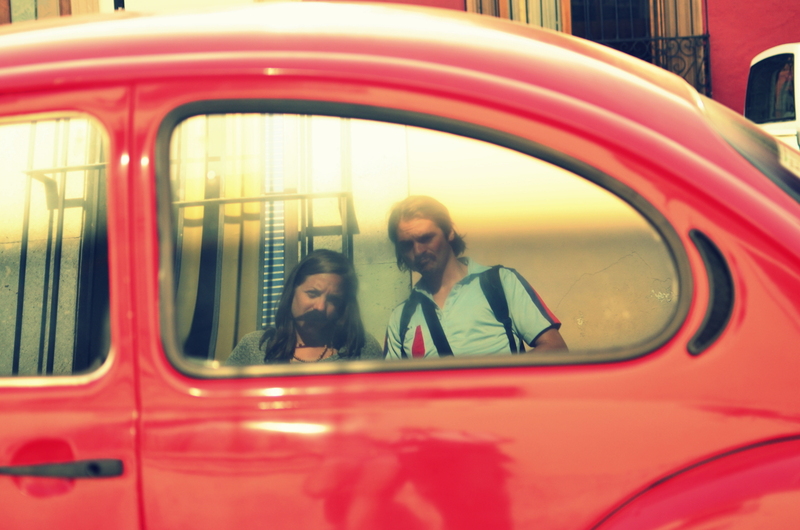 It was quickly decided that Oaxaca was a perfect place to call home for a week so we could get serious about learning Spanish. It had everything we wanted and needed in one convenient, beautiful city. 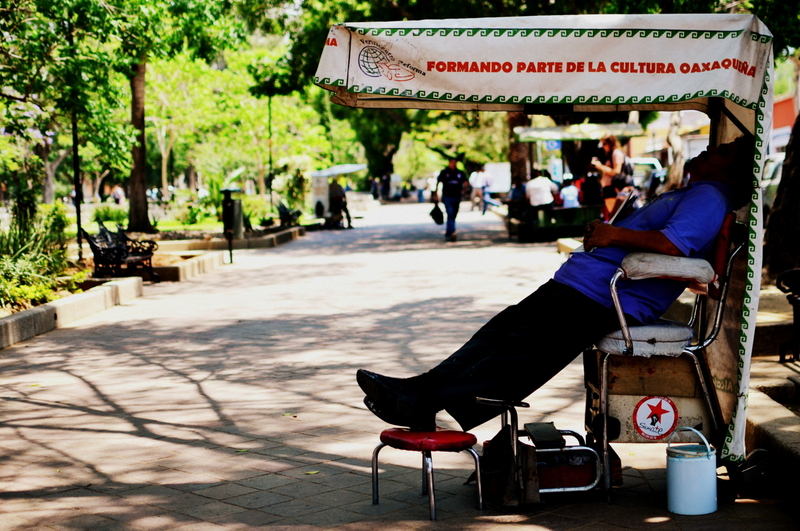 The pace of life here felt a little slower than other larger cities in Mexico and we became instantly comfortable. 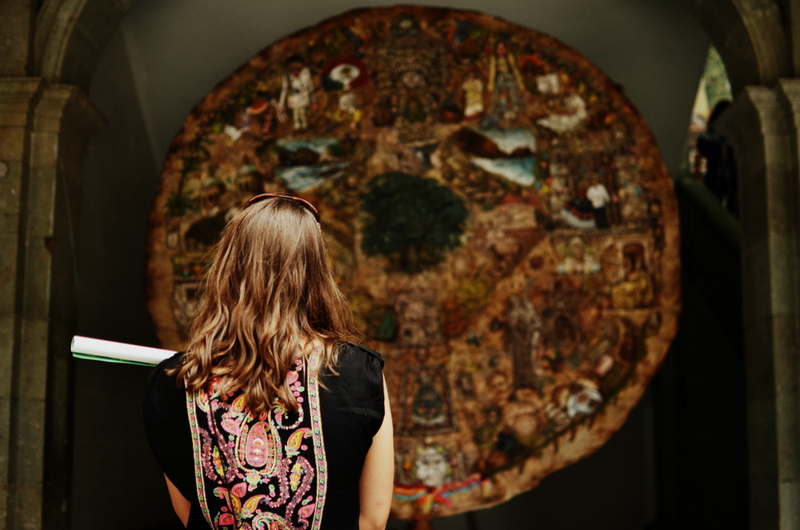 The historical roots run deep in this artisinal wonder and can be found throughout its entirety. 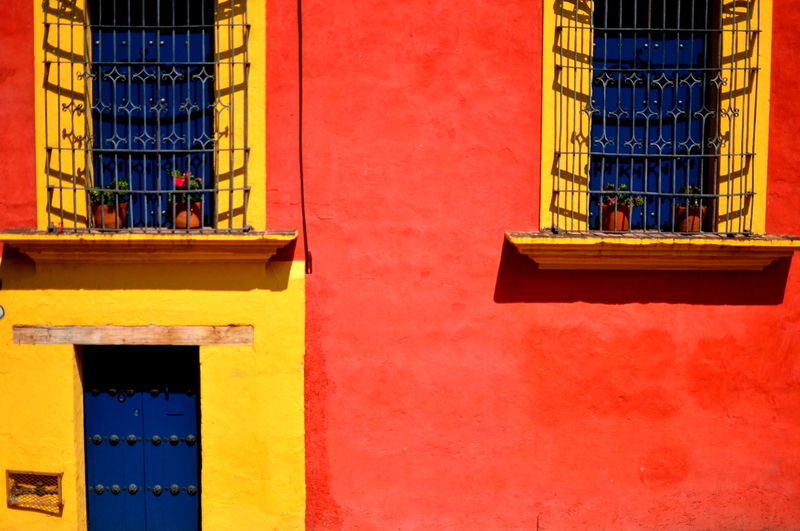 Colonial style churches, beautiful old mansions with 12 foot tall wooden doors, and buildings splashed with the classic Mexican color pallet are nested on square block streets. 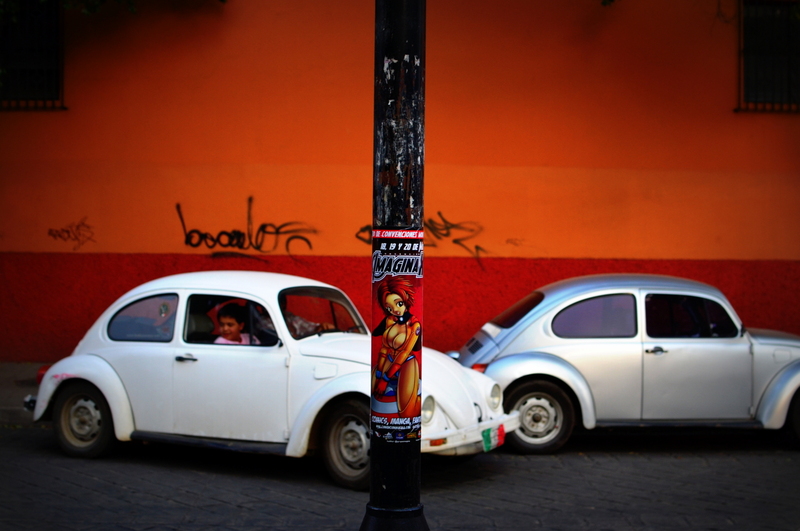 The roads around the city center are immaculately clean and it’s zocalo is brimming with activity just about every day and night. 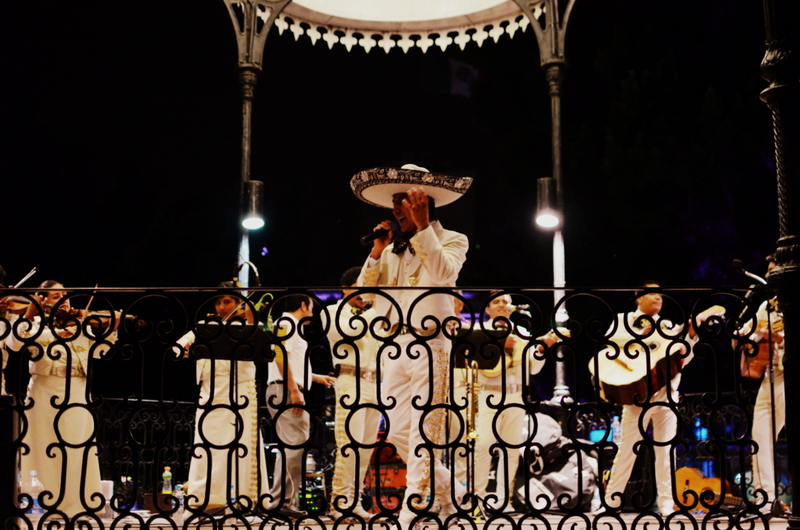 On one Friday night we stumbled upon Mariachi Oaxaca playing in the gazebo to a crowd of hundreds. After wandering right to the front of the stage we were wowed by the supremely talented musicians entertaining the masses showcasing their musical talents and insanely fast-tongued comedic interludes. This whole experience was encapsulated when we were watching an old couple dance comfortably together hand-in-hand for the thousandth time in their lives. Beautiful. 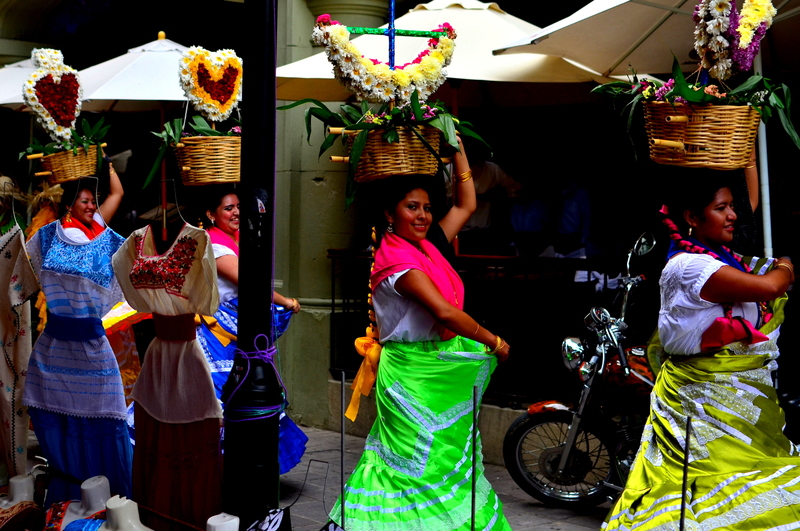 I’ve surmised from talking with people during our travels that Oaxaca is the jewel city of Mexico. 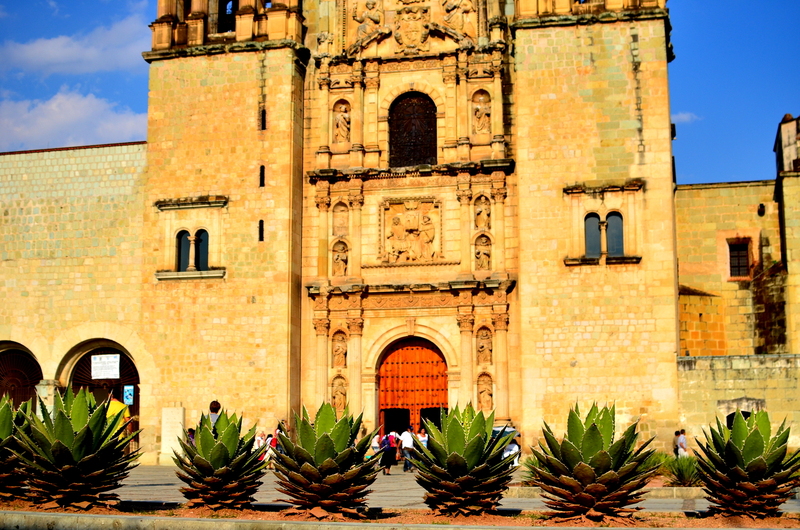 Oaxaca seems to be what Mexicans picture as the perfect version of what a city should be. 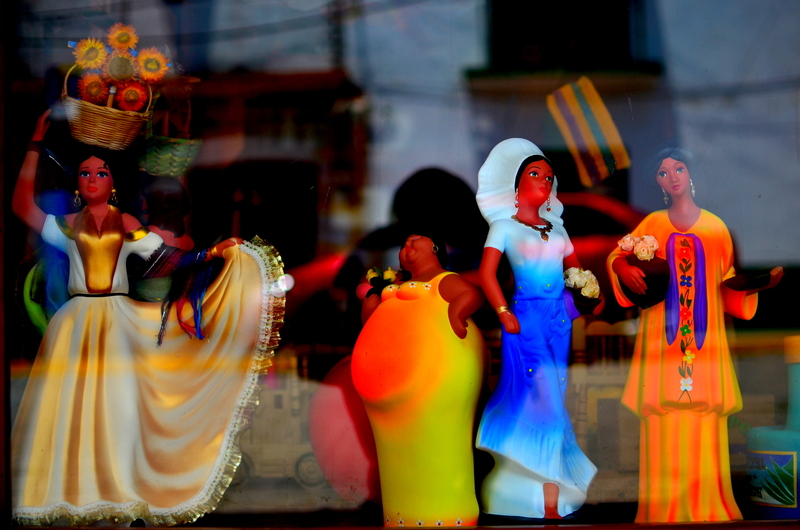 Stores, mercados, and street vendors all offer their version of beautifully sewn clothing, hand-made metal sculptures, painted pottery, and incredibly detailed paintings on brown leather squares. 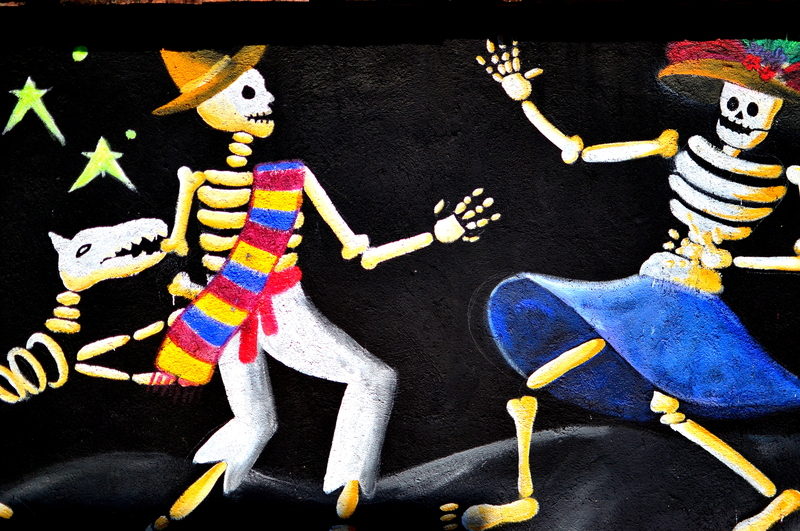 Today’s generation contributes to the modern art scene with amazing graffiti clinging to walls, murals covering entire buildings, and poster’s wheat pasted to walls advertising upcoming shows and events. 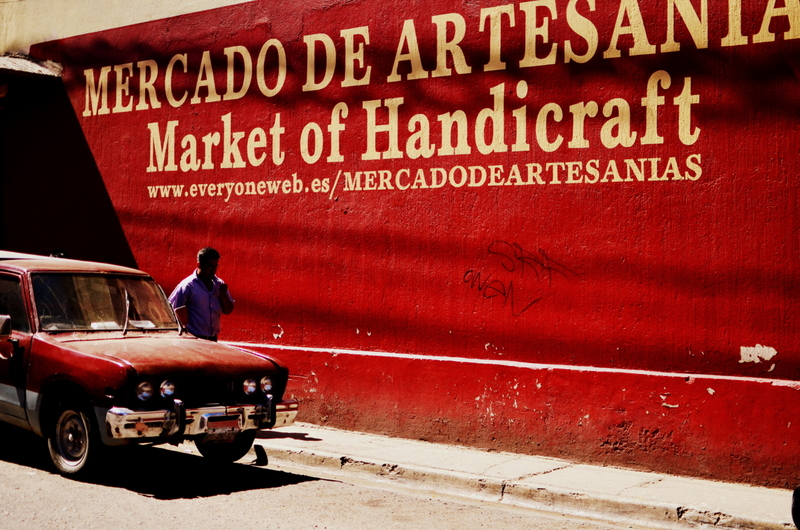 But step into the Mercado de Artesanias to get a real gauge on the classic handmade works of Mexican heritage and art. 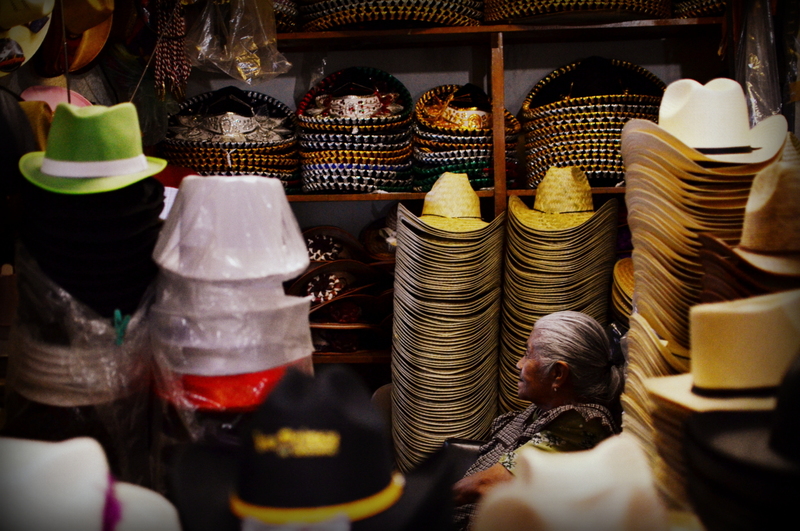 It is evident that some of the crafts available are completely geared towards tourists but most of the clothing and textiles found in the markets all have that Oaxacan flavor embedded into every thread. 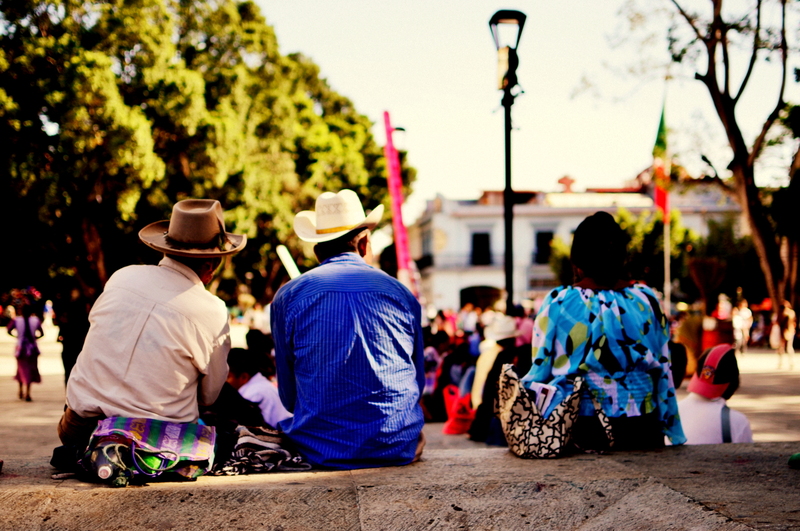 Oaxaca has a large population of indigenous people, mainly Mixtecs and Zapotecs, who continued to work well beyond their golden years using needles and threads instead of canes and rocking chairs. 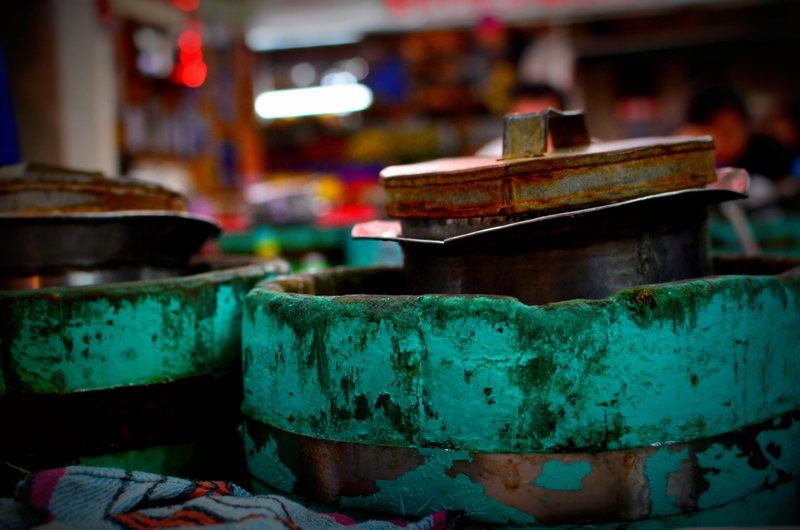 A walk through these markets would afford the view of these small, tough, and weathered senoras making their beautiful art by hand while passing time between potential sales. 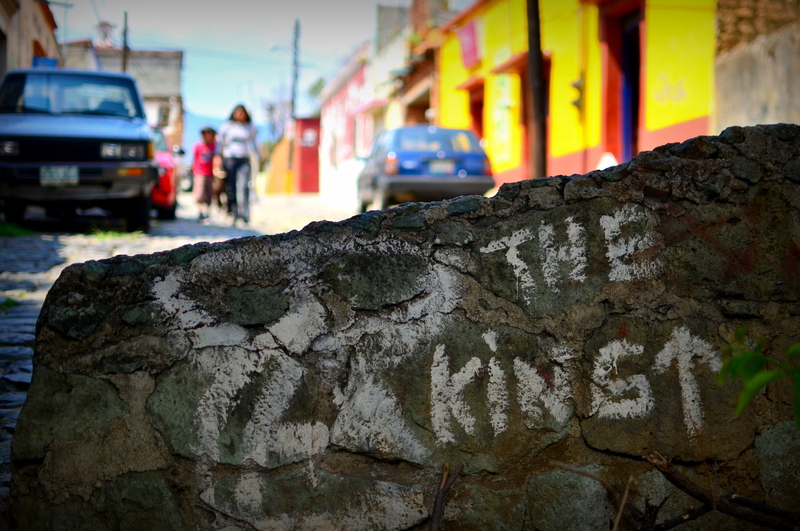 But there is also another side of Oaxaca that is often overlooked an unseen by most travelers glued to the city center. 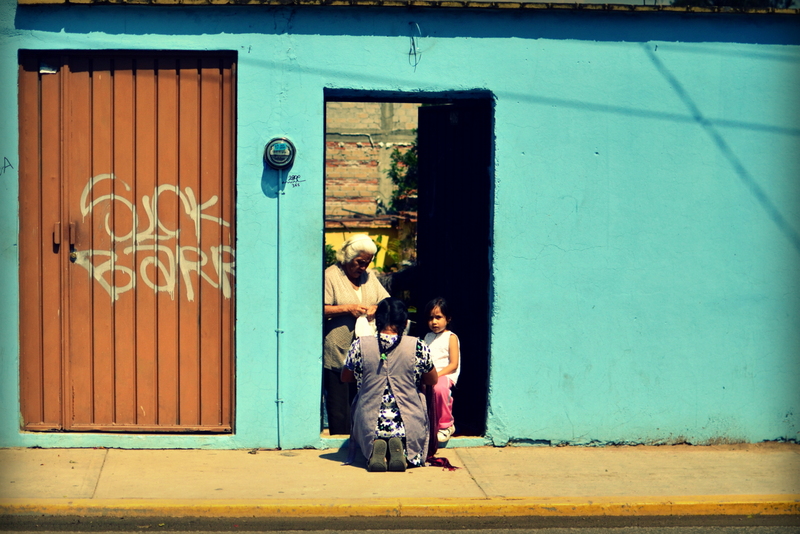 Oaxaca is one of the poorest states in Mexico and the fringe of the city consists of very impoverished communities. Tensions from the poor and indigenous communities often flare up into protests near the city center in front of government buildings. A protest involving public teachers blocked the main road one day and on another the road to Mexico City was blocked from a group voicing their opinions on the lack of government interaction with the indigenous communities in the short time we were there. 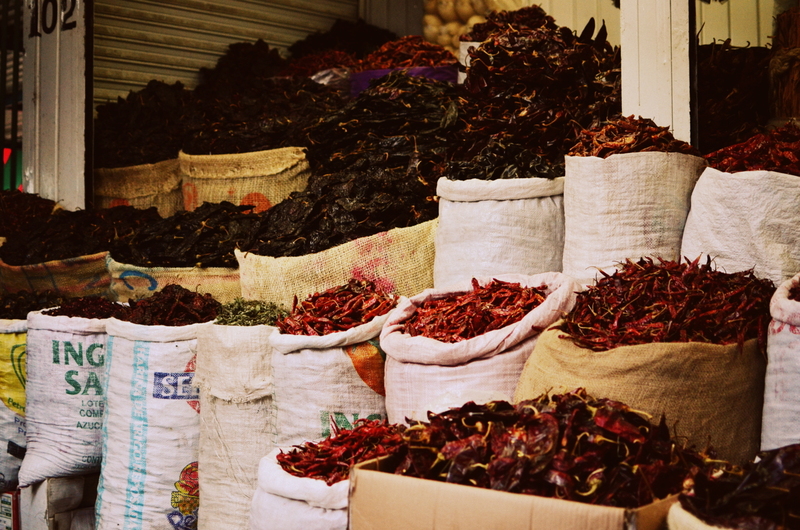 The overwhelmingly massive and lively food markets of Oaxaca are where we felt at home. 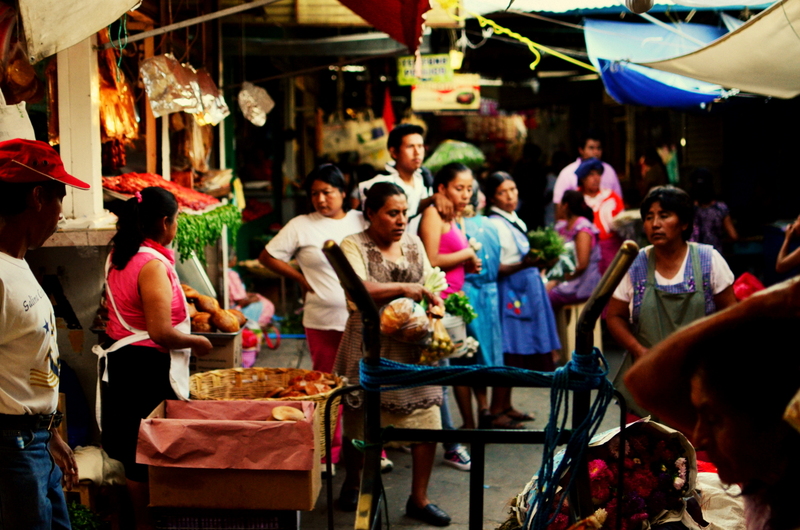 We found ourselves ducking into the shadowed entrances on the hunt for fresh produce, enjoying delactable licuados, scanning the carne stands for a freshly cut meat, sampling locally made chocolate, and searching for the best Oaxacan cheese on a daily basis. 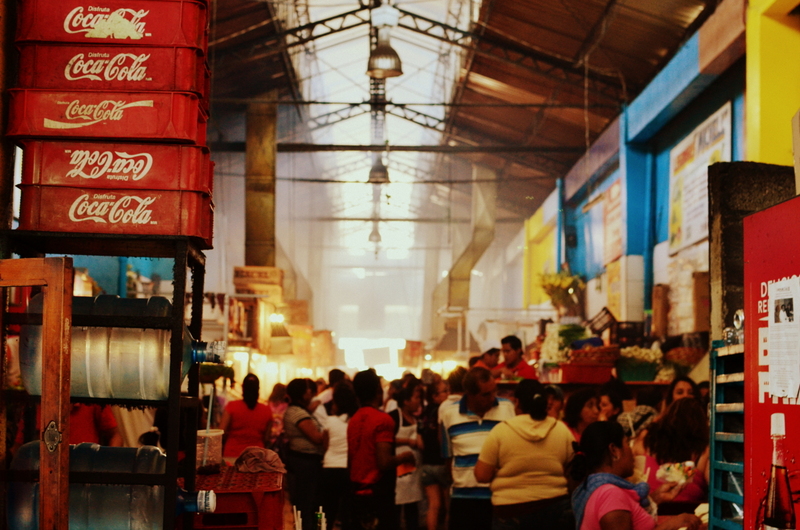 Our first adventure into Benito Juarez Market involved us getting lost and ending up at the same location time after time. It was as if the market was continually expanding in all directions. Convinced we saw everything we noticed smoke billowing out from the small entrance of the carne asada (grilled meat) corridor. We walked into this smoky cavern during the busiest part of the day, shoulder to shoulder with people ordering freshly barbequed guisados. There were no signs or instructions and it was assumed that you haggle for meals along the endless rows of purveyors searing their meats and vegetables over coal. We were in a completely different world and it smelled absolutely delicious. 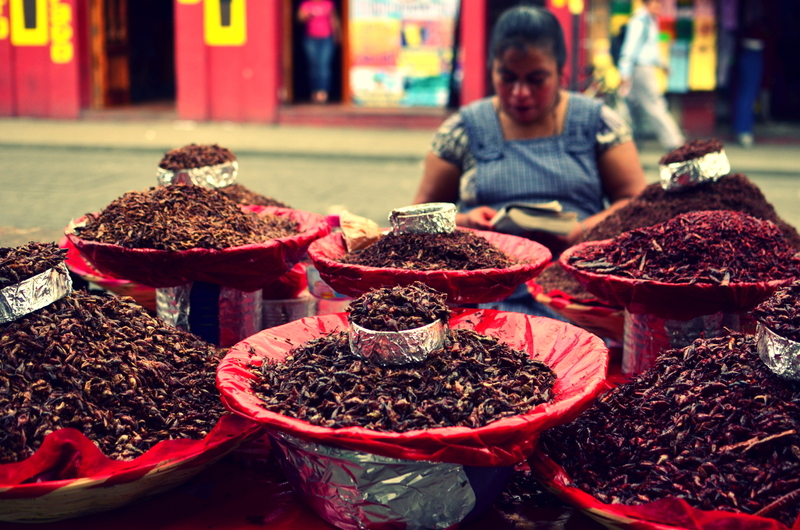 Oaxacan markets also had more obscure and adventurous fare including, but not limited to, fried grasshoppers (chapulines). We found it imperative to try things when a free sample is offered, regardless of how crunchy it is. 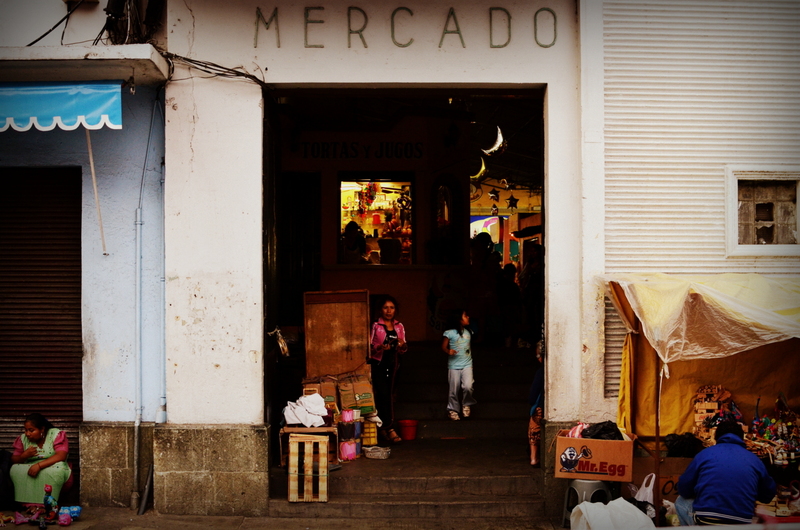 We were given multilple warnings about petty theft and the dangers of the oversized Mercado de Abastos. We wandered throughout it’s mega-mall sized footprint that swallowed up entire blocks with blue tarps, display tables, and a massive amount of people. Goods ranging from shoes, kitchen equipment, live poultry, breads, cheeses, chocolates, and art were abundant in this never ending scene. It’s easy to get lost here and easy to get taken advantage of as a tourist and it’s more than common practice to get your pockets cleaned by teams working together. 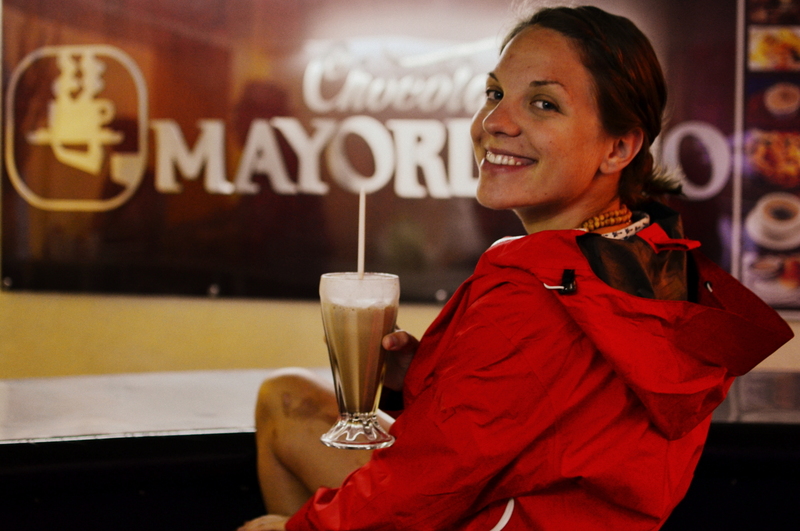 I must digress into the cheese and chocolate of Oaxaca. Oaxacan cheese is absolutely and utterly amazing. It’s crafted into a mozzarella-like consistency in long, flat strands that are the rolled up into a knot of delicious, freshly prepared chunk of heaven that will erase your memory of all cheeses consumed prior to it. Queso Oaxaca is found everywhere but the quality and taste can vary quite a bit so never say no to a free sample. 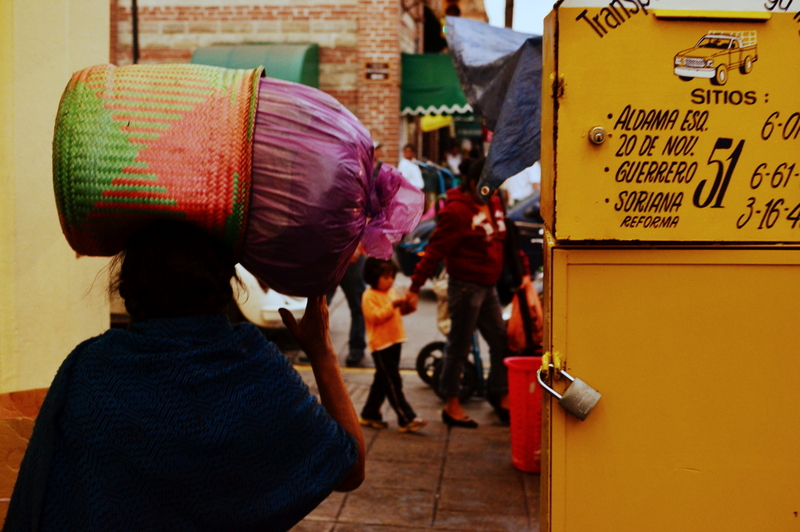 The chocolate is also a prized and very delicious treat revered by Oaxacans . They make chocolate here in the most basic form, using natural ingredients like cinnamon, vanilla, and walnut for flavoring with cocoa pods, sugar, and soy lecithin. After scouring the markets we figured that Mayordomo (a chocolate chain store) had the best tasting chocolate and always gave free samples whenever we set foot in the store. 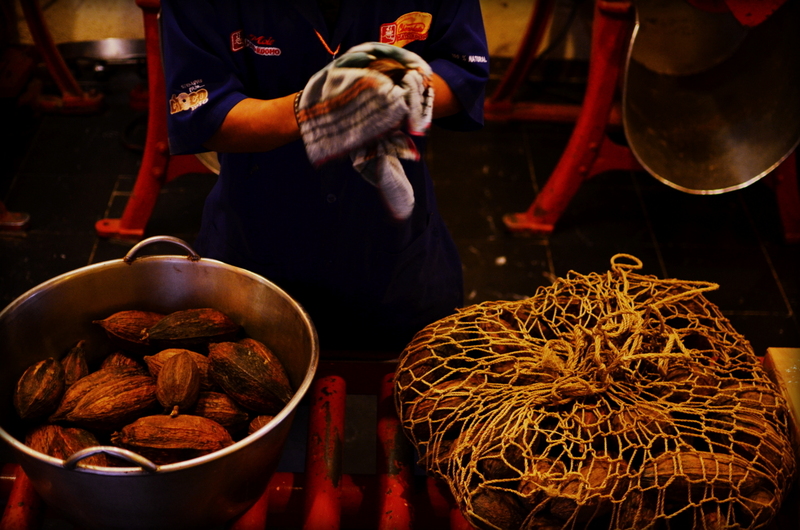 Stick around the store to watch them make chocolate in person by grinding the cocoa pods, cinnamon sticks, vanilla, and the other fresh ingredients producing a thick, chocolate paste. They also offered a wide variety of classic mole variations para llevar for you to take a small piece of Mexico home with you. 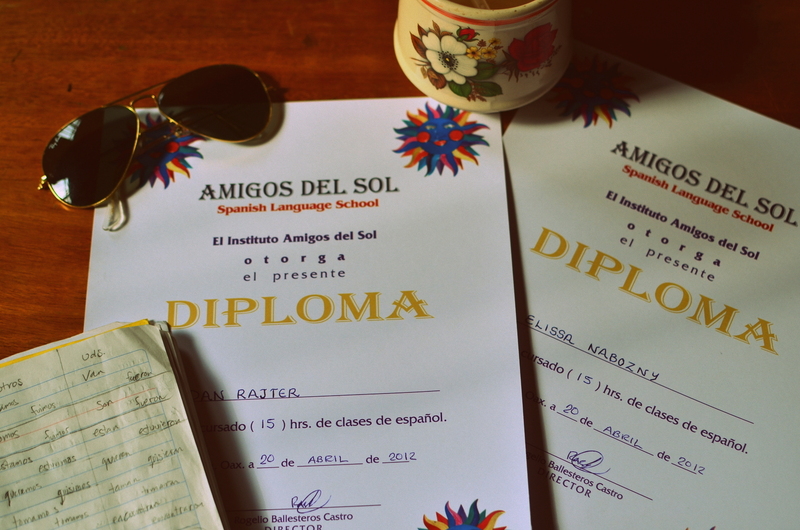 We found Amigo’s Del Sol (http://www.oaxacanews.com/amigosdelsol.htm), a private Spanish school run by a very passionate teacher focusing on individual needs in a small (3 person max) setting. Rogelio (our Maestro) catered to our needs seamlessly from the beginning as we found ourselves in school every day for 3 hours a day. Classes started off great but our lack of sleep due to the hot and stuffy hostel room we had contracted for the week was getting to us. After four nights of very little sleep the chronic exhaustion coupled with learning a new language was too much for me and advocated a meltdown one sleepless night. Rogelio coached us to ask for a fan in spanish and within minutes of getting back we had a fan in our room. Perfecto! 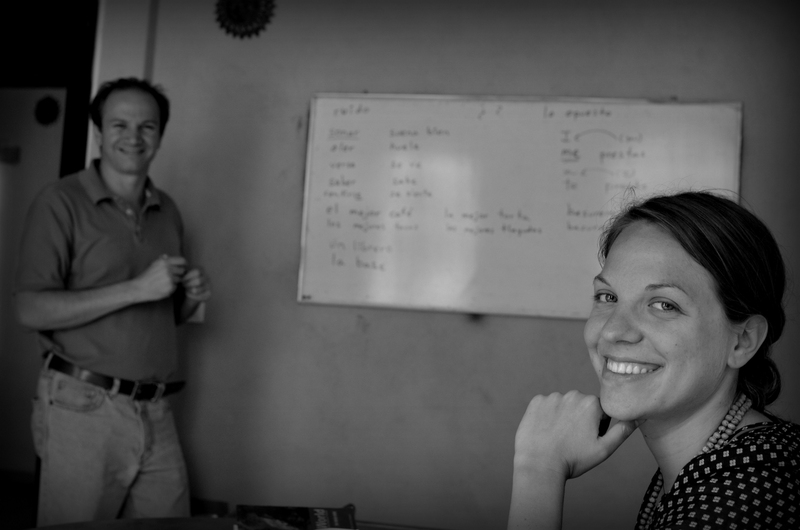 The crash course in Spanish was just what we needed to get some of the language basics figured out in our heads and to learn important building blocks for ongoing language learning process. We also met an awesome couple from Australia on this leg of our trip who were in the final stages of completely our exact journey in reverse. They started in Brazil about 14 months ago and were working their way to Mexico City for a flight to LA to begin their cross country journey across the states (http://tomclaire.blogspot.mx/). They shared stories of their crazy journey and the bumps along the road (including hiking through the Darien Gap) without sugar coating the details of what’s to come. We all went out for some drinks in a really local bar with live music and wound up getting swept onto the dance floor for some free lessons in Mexican slow dancing. My dance was interrupted by a short bar fight that eclipsed when a bottle was smashed over the head of an hombre next to me. The music stopped, he was led out of the bar, and the music started up again momentarily. Ahh Mexico. 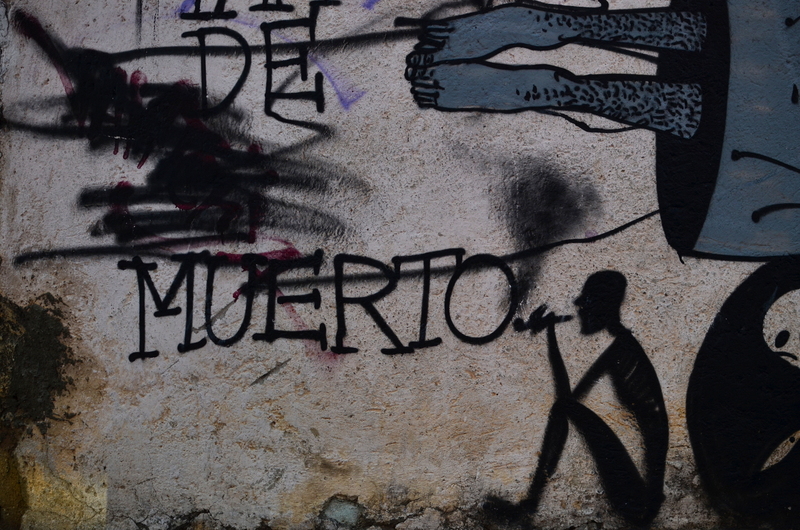 It was sad to say goodbye to Oaxaca’s warm embrace but it was time to get moving and see what Chiapas had to offer. 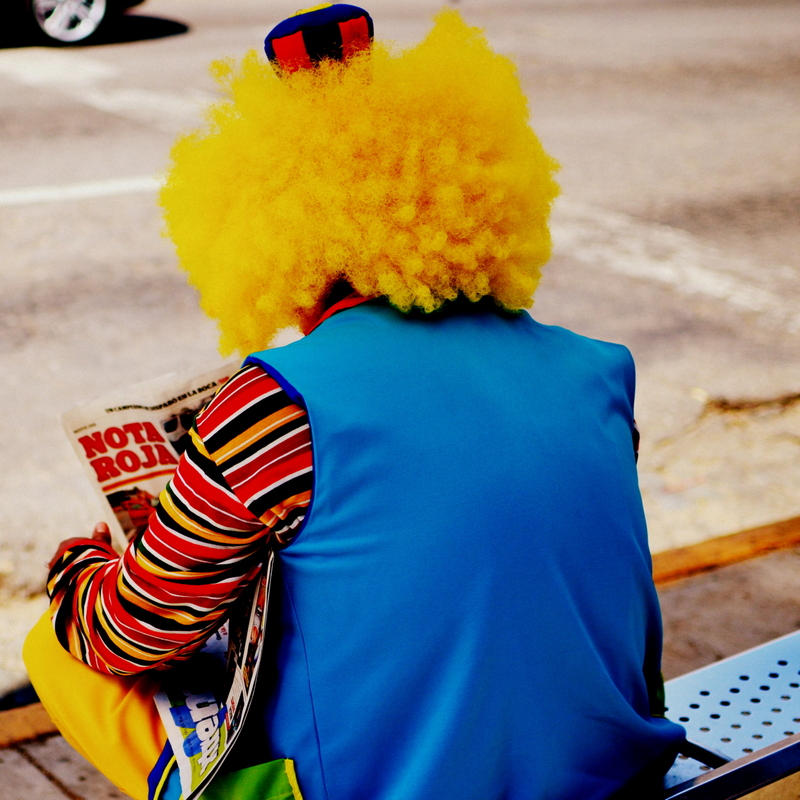 It’s always such a pleasure reading about and seeing your adventures. Godspeed. 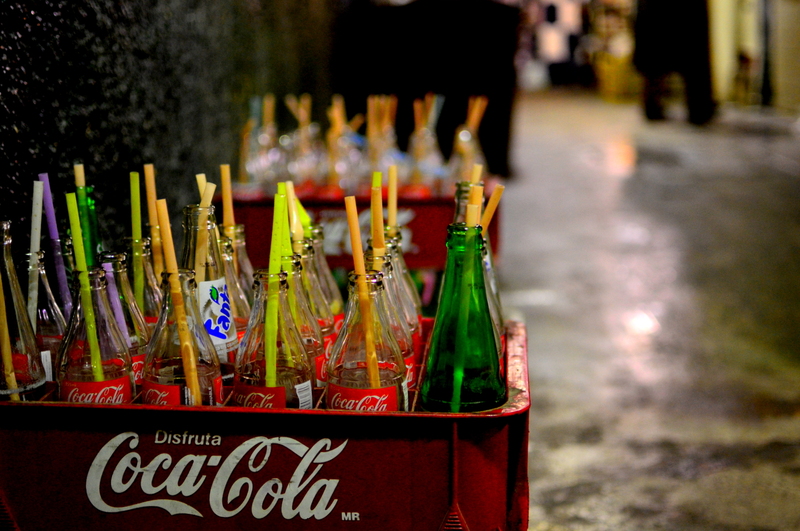 I can’t tell you how much I enjoy reading about/seeing pix of your travels. Mexico was not high on my ‘To Visit’ list, as I don’t speak the language (but would like to) and am not interested in the beach/resort scene. 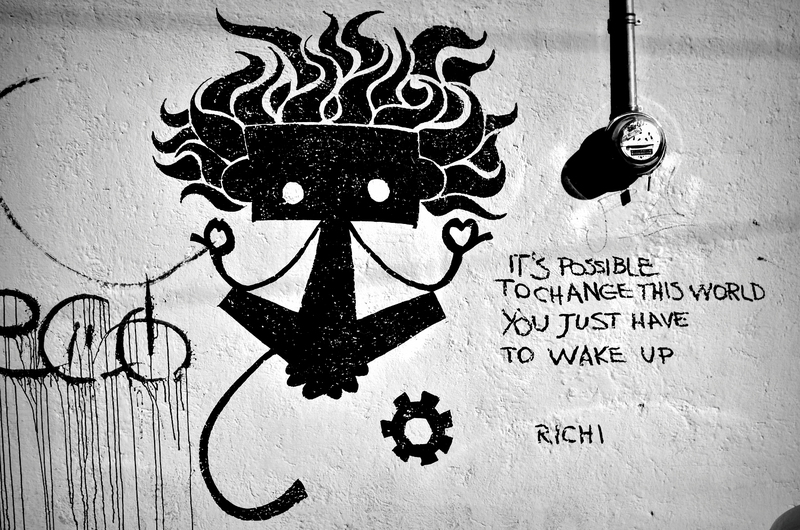 However, with every post (most then forwarded to friends and family), I am itching to head in that direction. I credit your fine pictures, wonderful writing, and adventurous spirit! 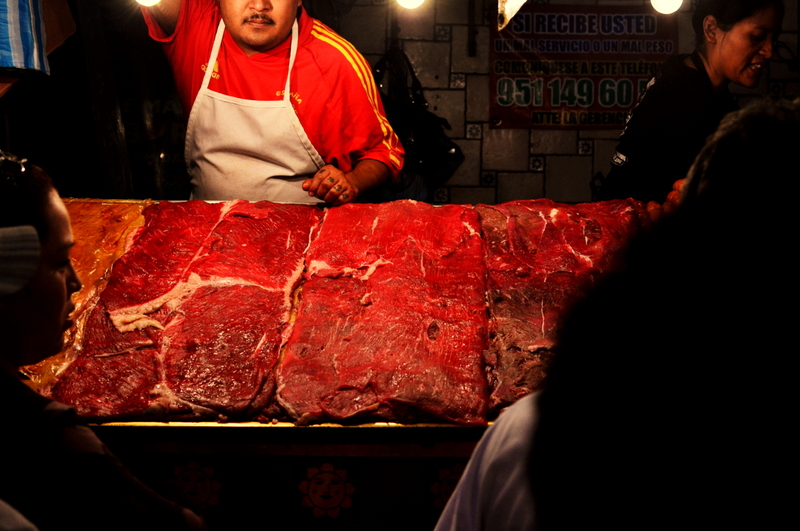 PS: I love the meat market shot – shooting in markets is always so difficult, and you pulled it off effortlessly! OK, and the women talking on the sidewalk/ford taillight – very creative way to get another hard-to-shoot scene! 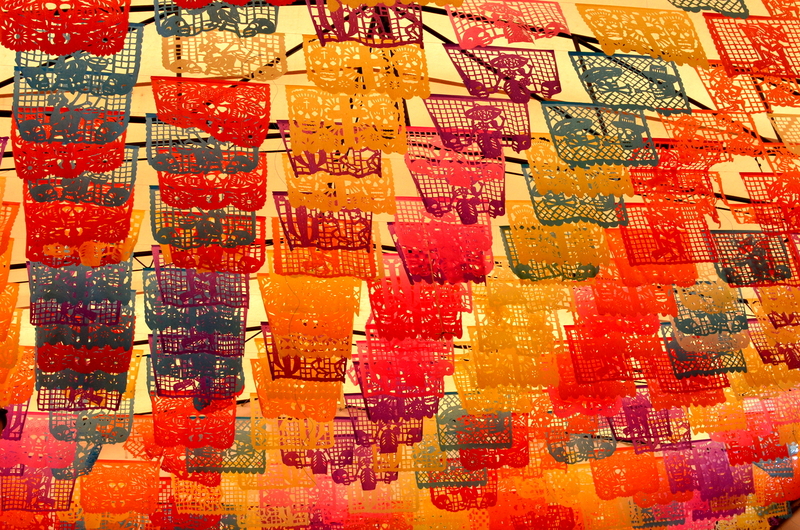 Mexico is a very beautiful place beneath the surface of it’s reputation. 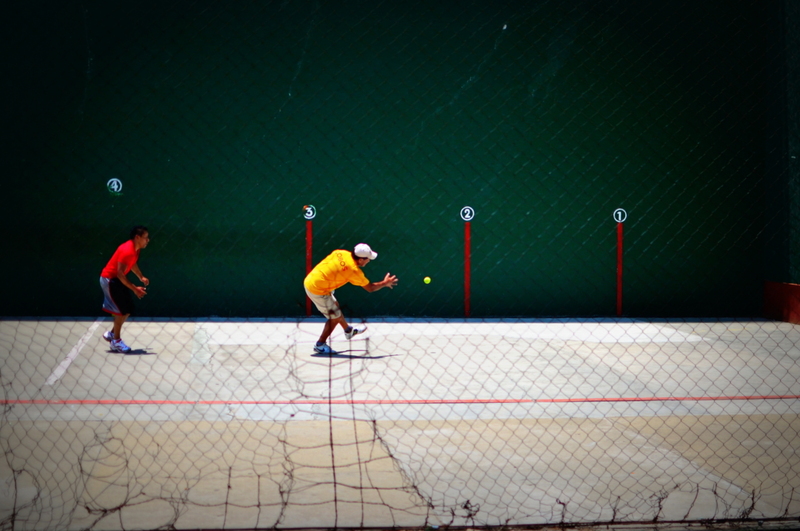 The language barrier is tricky but with each passing day my ears are becoming more accustomed to espanol, poco a poco. I’m glad to hear your perspective might be shifting about the Mexico outside of the resort influence. 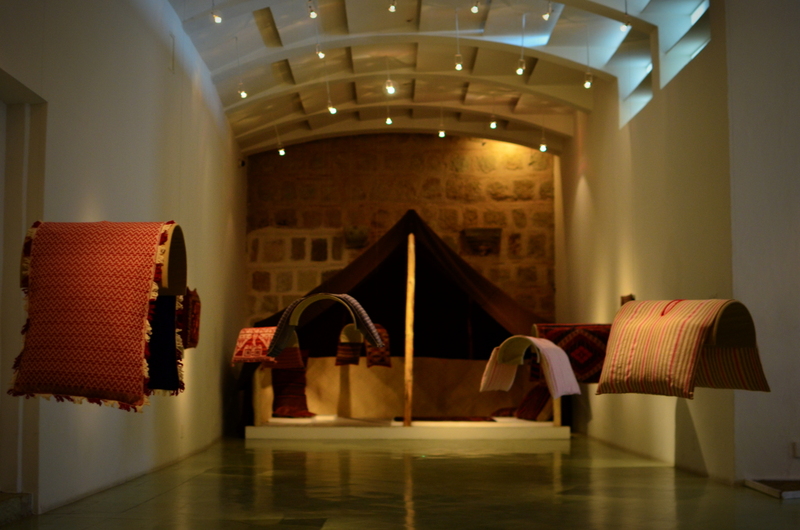 The culture here is really amazing and I’ve met many people who traveled here once upon a time and made it there home. Thank you for the comments, they are always appreciated. 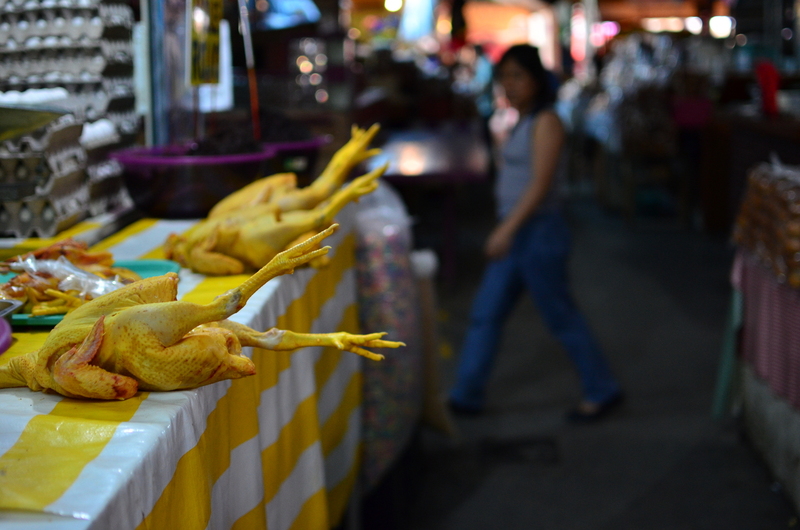 The markets have a lot to offer visually, amongst all the other senses too. 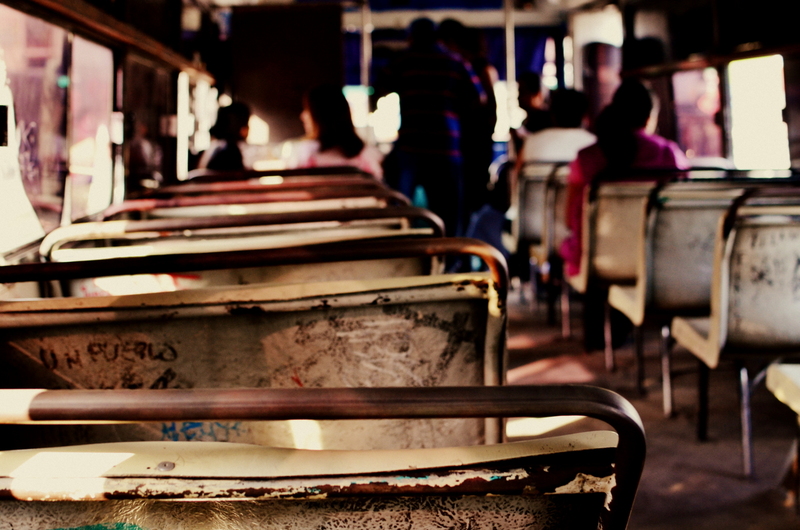 i enjoy these photos and this blog so much, thank you! 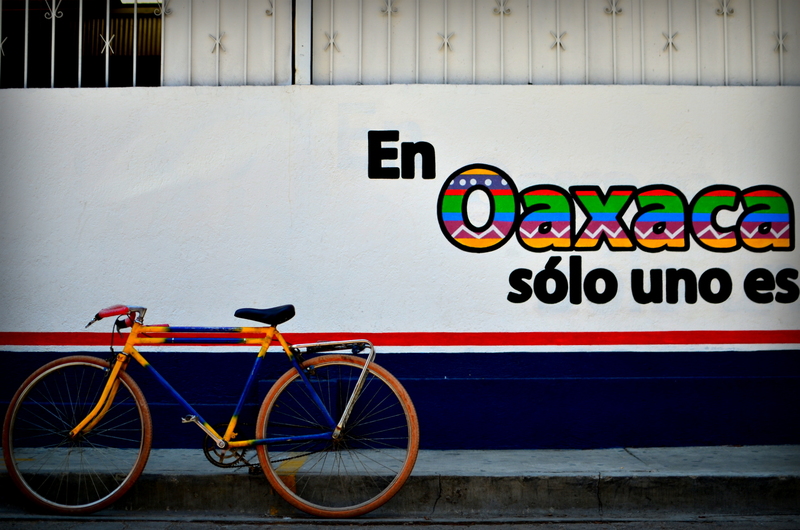 I have been following your blog and I was so happy to see and read this one about Oaxaca. 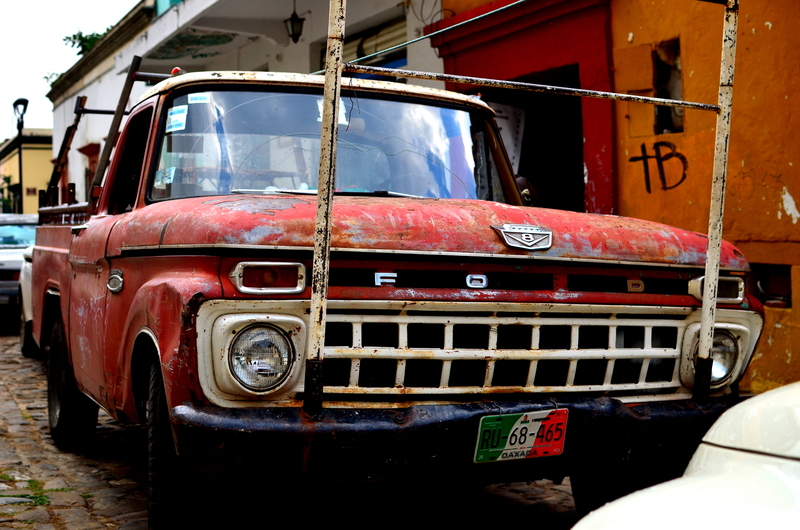 A few years ago I spent a month in Oaxaca. 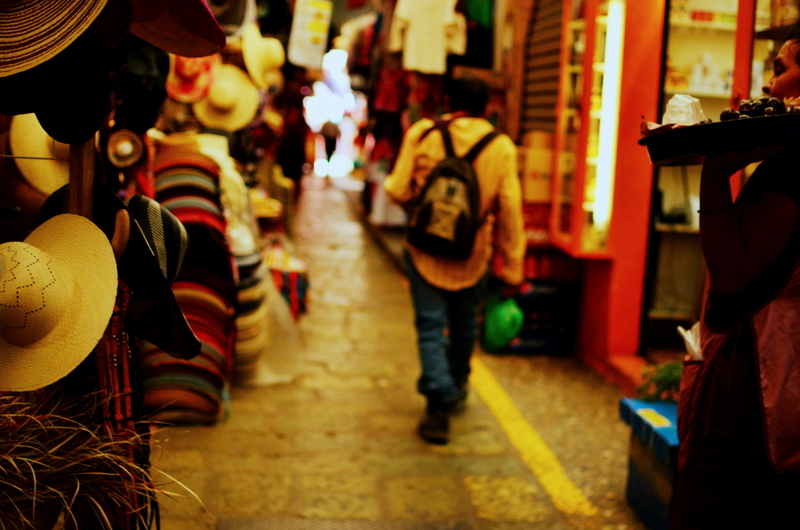 I studied Spanish in the mornings and spent the afternoon wandering the lanes of Benito Juarez market. You have captured it perfectly. Thank you. Your blog is always a treat! 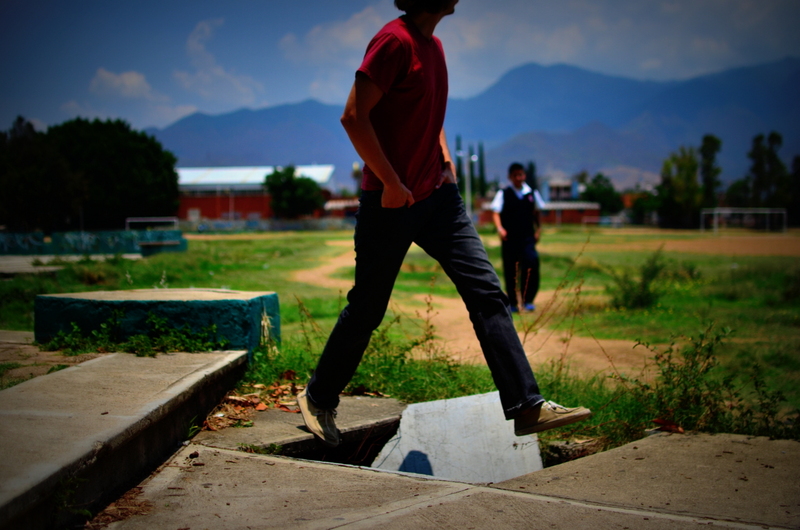 Oaxaca was truly an amazing place. We still talk about her on a daily basis. We could have easily spent a month there. Gracias por las amables palabras! 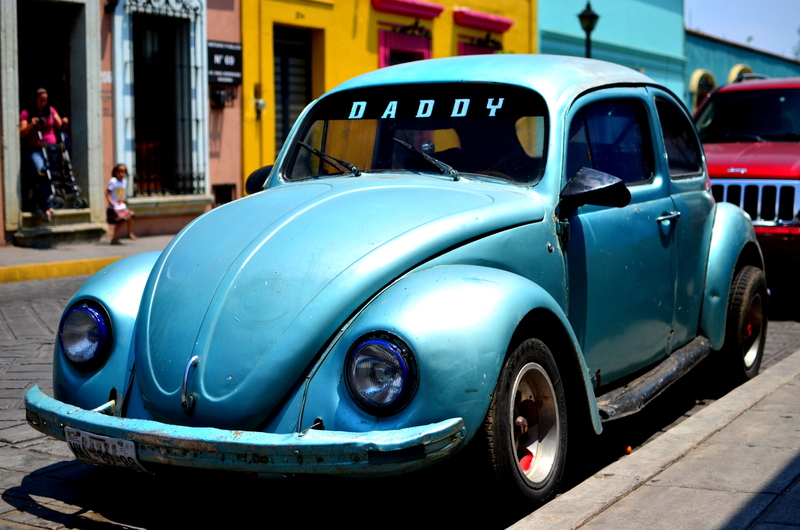 A pleasure masquerades all the through the stretch of your blog.